The device can receive alerts about the geofence when a particular geofence service is started using the Start() method of the Tizen.Location.Geofence.GeofenceManager class. If the user revokes permission to use the location information, an UnauthorizedAccessException is returned to the application attempting to use the geofence service. Asynchronous geofence-related alerts (in or out) and event handling (a fence added or removed) are implemented with event handlers. Geofence alerts are received using the values of the Tizen.Location.Geofence.GeofenceState enumeration. Geofence definition refers to defining an instance of the Tizen.Location.Geofence.Fence class. 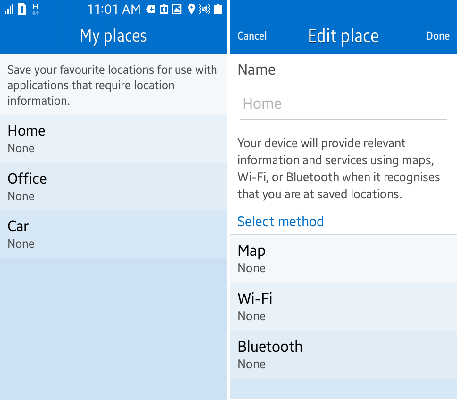 The 3 types of available geofences are geopoint, Wi-Fi, and Bluetooth. When creating the geofence, define the type using the values of the Tizen.Location.Geofence.FenceType enumeration. Tizen provides the user a way of managing geofence places and fences through the My Places application. The following figure shows the default places and supported fence types. My Places controls the adding, removing, and updating of places and fences. Home, Office, and Car are the default places. Map, Wi-Fi, and Bluetooth are the supported fence methods. Car supports only Wi-Fi and Bluetooth as fence methods. Each geofence manager is an independent service. The event handlers are set for a given geofence manager and are called only if the service is started by their manager. Start the geofence service using the Start() method of the Tizen.Location.Geofence.GeofenceManager class. This call is asynchronous and only initiates the process of starting the service. Once the service is started, the added event handlers are invoked when their corresponding events take place. To know when the service becomes enabled, use the StateChanged event of the Tizen.Location.Geofence.GeofenceManager class. Using the geofence service for geopoints adds to power consumption, so if the service is not used, stop the status alerts using the Stop() method of the Tizen.Location.Geofence.GeofenceManager class. Call the Start() method again if the alerts are needed. If you destroy the Tizen.Location.Geofence.GeofenceManager instance, there is no need to call the Stop() method to stop the service, as the service is automatically stopped. To track the state of the geofence, use the GeofenceEventChanged event of the Tizen.Location.Geofence.GeofenceManager class. An event handler is invoked whenever there is a request from the user, such as to add a geofence or to start a geofence service. Note The geofence change event handler is used to let the user know whether the request is successful on the server side. This handler is invoked only in the case of an asynchronous method. For a synchronous method, an error is immediately returned. Receive event-based notifications with an event handler. You can be notified when the user crosses a particular fence. The handler receives the current state of the user (whether the user is in or out of the virtual boundaries of a geofence) with each call. Register the handler using the StateChanged event of the Tizen.Location.Geofence.GeofenceManager class. Retrieve the current state on request. Register the handler using the ProximityChanged event of the Tizen.Location.Geofence.GeofenceManager class.